As well as editing existing entries, we would love you to share your local knowledge and your – or a relative’s – memories of the Second World War with us by creating brand new entries on the website. One of the easiest ways to do this is by creating a ‘person’ record. This can be done by clicking on the ‘browse’ page or from any of the entry pages on the website by clicking the ‘add entry’ button and then selecting ‘person’. 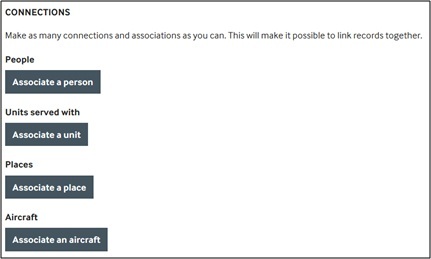 If you are creating a record for a civilian, for example, for yourself or a relative who was not an enlisted person, then select ‘no’ at the top of the page. 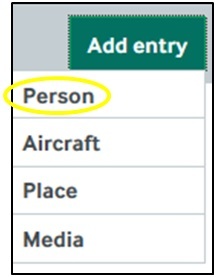 The ‘personal details’ section allows you to add some basic information such as name, nickname(s) and nationality whereas the ‘biography’ section allows you to add much more detailed information such as birthplace and where you lived or were based during the Second World War. 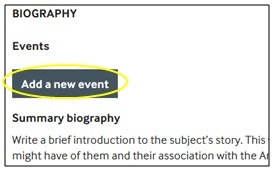 Clicking the ‘add a new event’ button will allow you to add life events to your page. Clicking the drop-down box under ‘type’ will show you all of the life events which you can add to your page. For each of the life events you have the option of adding dates from and to, as well as a brief description of the event, if you wish to give more details. Selecting a location for the life event by clicking the ‘select a location’ button will allow you to search for and add any location. 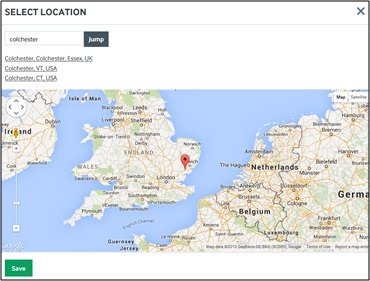 Simply type in the location you are looking for, click ‘Jump’ and then select the correct location from the list. You will be shown the location on the map, once you are happy this is correct, click the ‘save’ button. To add another life event use the ‘add a new event’ button. Every location which you add for a life event will be displayed on a map which will appear on your final page. The ‘summary biography’ section is the place where we want you to share the memories that you have which relate to the American airmen in Britain during the Second World War and your wartime experiences. There really is no right or wrong way to go about doing this and all memories and stories which you can share with us are a valuable contribution to the website. Perhaps one of your relatives married an American airman or maybe your home was used by American servicemen in the Second World War? Maybe you’ve heard stories about the Americans in your local pub or have memories of visits to your local airbase? All of these examples and more would be a perfect addition to this section of your page. One important aspect of the American Air Museum website is the ability to make connections between records on the site using the ‘Connections’ tab. This section is for you to try and make as many connections between your record and others on the website. You could link your record to the people, places and aircraft you mention within the information that you provide. E.g. a bomber pilot might be linked with his aircraft, his crew, his unit and his base. This is done simply by clicking one of the ‘associate’ buttons and then searching for the record which you wish to link to yours. Once you have selected the record, click ‘save’ at the bottom of the page. Finally, one of the most important parts of creating a record is completing the ‘source message’ box at the bottom of the form. The purpose of this box is very simple: tell us how you know what you know. This is where you can add all of the sources which you may have used when finding information to add to your page. If you are recording your own memories or a relative’s this could be something as simple as ‘self’ or ‘told by my father’. If you have carried out some additional research, then reference the book or add a link to any websites which you used. This helps other users work out where the information displayed has come from and makes the website a more credible source for other researchers. Please fill this in as completely as you can. It cannot be retrospectively edited and is very important. Once you have entered the source message, click the ‘save’ button to finish. Congratulations, your entry has now been added to the website!